Athlete and activist Colin Kaepernick and activist and comedian Dave Chappelle are among the eight distinguished people who will receive the W.E.B. 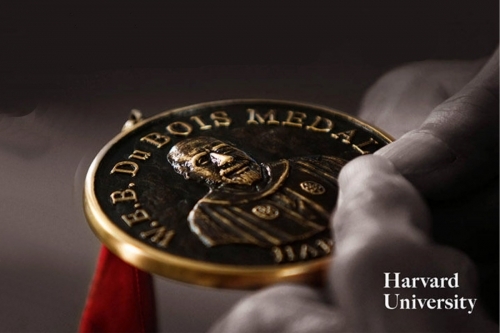 Du Bois Medal at the sixth annual Hutchins Center Honors presented by the Hutchins Center for African & African American Research at Harvard University. Honorees also include Kenneth I. Chenault, chairman and a managing director of General Catalyst; Rensselaer Polytechnic Institute President Shirley Ann Jackson; philanthropist and founder of Avid Partners, LLC, Pamela J. Joyner; psychologist and author Florence C. Ladd; Bryan Stevenson, founder and executive director of the Equal Justice Initiative; and artist Kehinde Wiley. All of the Du Bois medalists have made significant contributions to African and African-American history and culture, and more broadly, are individuals who advocate for intercultural understanding and human rights in an increasingly global and interconnected world. The ceremony will be held Oct. 11 at 4 p.m. in Sanders Theatre, Memorial Hall, 45 Quincy St., Cambridge. Kehinde Wiley has firmly situated himself within art history’s portrait-painting tradition. He engages the signs and visual rhetoric of the heroic, powerful, majestic, and the sublime in his representations of urban black and brown men and women found throughout the world. By applying the visual vocabulary and conventions of glorification, history, wealth, and prestige to subject matter drawn from the urban fabric, the subjects and stylistic references for his paintings are juxtaposed inversions of each other, forcing ambiguity and provocative perplexity to pervade his imagery. Wiley holds a B.F.A. from San Francisco Art Institute, an M.F.A. from Yale University, and an honorary doctorate from Rhode Island School of Design. His paintings are in the collections of more than 40 museums, including the National Portrait Gallery, Washington, D.C.; the Los Angeles County Museum of Art; the Hammer Museum, Los Angeles; the Museum of Contemporary Art, Los Angeles; the Metropolitan Museum of Art, New York; and the Brooklyn Museum. Wiley was recently the subject of the documentary “An Economy of Grace” (2014, Show of Force). The U.S. Department of State honored him in 2015 with the Medal of Arts, celebrating his commitment to cultural diplomacy through the visual arts. In February 2018, his portrait of Barack Obama was added to the permanent installation of presidential portraits in the Smithsonian’s National Portrait Gallery. The Hutchins Center at Harvard includes the W.E.B. Du Bois Research Institute; the Ethelbert Cooper Gallery of African & African American Art; the Hiphop Archive & Research Institute; the Afro-Latin American Research Institute; the Project on Race & Cumulative Adversity; the Project on Race & Gender in Science & Medicine; the History Design Studio; the Image of the Black Archive & Library; the Jazz Research Initiative; and two publications, Transition and the Du Bois Review.